Throne of Glass is a young adult fantasy novel. I can attest to the fact that it is very those two things so if that is not your cup of tea I would skip this one. It is about a 18 year old assassin named Celaena Sardothien. She is the most feared assassin on the continent but one day she gets caught. After she gets caught she is sent to a slave camp and this is where the book starts. She is found in the camp by a hooded man who brings her to the Prince of Ardalan, Dorian. He tells her of a competition that his father the King is having. The competition is to find the best assassin in the land who will serve the king. Her reward is that she will gain her freedom. Celaena is an amazing female character who does not care what anyone else thinks and will not step down for any man. She has so much sass it is amazing and as a person who would love to be sassy it was great. Her interaction with all of the other characters are amazing. She is an amazing character and overall amazing woman in all respects. She was an amazing point of view for an aspiring feminist. Bottom line: I started reading the Throne of Glass series earlier this month as the first book of the month. This was a mistake. The Throne of Glass series is an amazing series with major twists and turns along the way. I was completely hooked. So if you are planning to read more than just this series over the month read this book last. This book is definitely not for anyone less than 13 I would even say possibly late 13s at the most. Celaena is amazing but she does have a bit of a foul mouth. There are also many kissing scenes so that is why I would say late 13 at the most. More please…: 9 Just because of the foul language and the kissing. Waverly and Oliver are two flies who live by themselves in a place with spiders and many enemies. One day they see something that looks like a comet fall to earth. It is a fly who only remembers his name, Ben Beesly. His two new friends nurse him back to health. Then his friends get bitten by some poisonous spiders and he needs to save them. They slowly degrade until he has to carry both of them. He goes to the spiders to try to get a cure. Will he succeed? Harry Potter is an abused child that lives with his extended family who hate him. Both of his parents were killed in what he thinks was a car crash. He starts getting letters from some school but his Uncle won’t let him read them. On his 11th birthday a big man that says he is a wizard takes him to a school called Hogwarts. He gains two close friends Ron and Hermione and many enemies. Ron, Harry, and Hermione know that the school is hiding something. They look into it and have to defeat a number of challenges to save the school and the sorcerer’s stone. Bottom line: These books are all amazing. J.K. Rowling gets you wrapped up in the ideas that she presents in these books. You love Harry and his relationship with his friends. This book is for 9 or 10 year olds. They books do get scarier as they go along because they follow Harry as he gets older. Harry also gets in more perilous situations. Insurgent is the sequel to Divergent. Tris is grieving the death of many friends and family. This makes her very angry and hopeless. She does stupid things that lead to other people getting hurt trying to help her. Her relationship with everyone is very rocky and strange. She is still a very good narrator but you do spend a lot of time with her. She releases a video to the public that tells them some very important things. The next book is about what she does with the consequences of showing the video. Bottom line: This book is okay. Not my favorite though. In the first book, you learn to love Tris and her relationship with not only Four but her friends as well. In this book Tris and Four’s relationship is rocky at best, and Tris has a very suicidal nature. I would say that this book is still okay for 6th graders but later 6th graders that have a stable environment. Only because of Tris’ suicidal nature. This book is still very important to the story. Speak Love is a non-fiction how-to sort of book. It is about speaking love as a teen or close to teenager. She is funny and tells stories about how she didn’t speak love. She doesn’t make you feel too bad but gets across not to be mean to people. She gives you bible verses to read and questions to journal. She is funny and I think this book can change the teen world as we now know it. Bottom line: It’s a good book. I got bored. I think because of the only reason that I am a bit younger than I think you really should be to read this. And also I stopped to read other books before I finished this so I think that was another problem. A good age is 13 years old. Divergent is about this girl named Tris who finds out that she is divergent. Being divergent is very dangerous. It means that you fit into more than one category or faction. There are five factions: Erudite, the intelligent; Dauntless, the brave; Abnegation, the selfless; Amity, the kind; and Candor, the truthful. In this society, once you are 16, you take a test to find out what faction you are supposed to be in. The next day, you chose what faction in front of everyone in all the factions. You choose by cutting your hand and dropping your blood into a bowl. She chooses Dauntless and has to go through initiation which if you do not pass you will have to live homeless in the factionless. She finds her best friends and her boy-friend Four. Then the Erudite put transmitters in the Dauntless. They control the Dauntless to attack Abnegation because the Erudite want power. 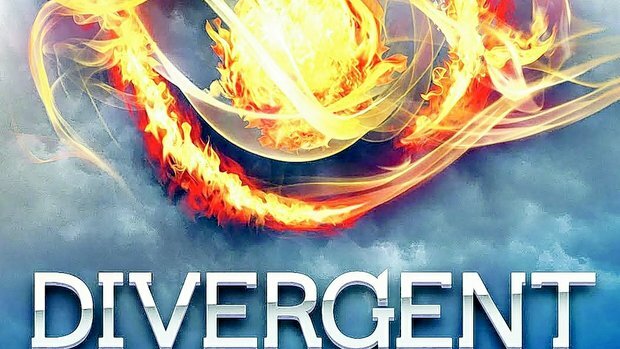 Tris has to try to save everyone. Bottom line: I love this book. I actually was Tris for Halloween. So, I love this book series. It is for 6th grade and older. I read them in 6th grade, and they are awesome.